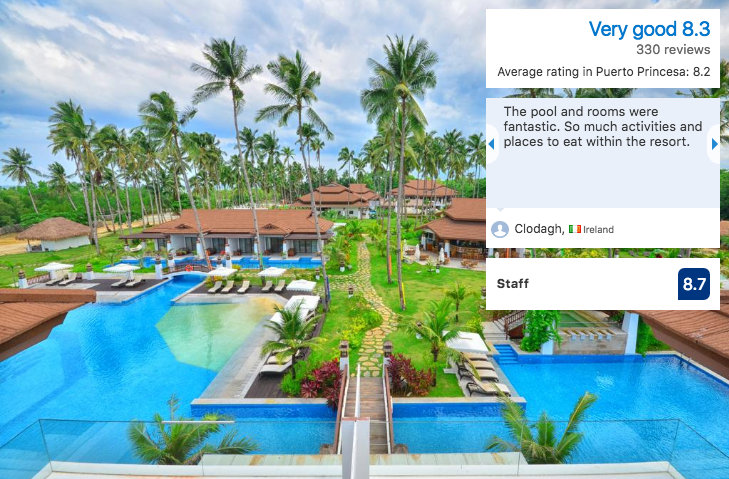 Trying to figure out which Palawan resorts are the best? Don’t worry, I’ve got you covered! 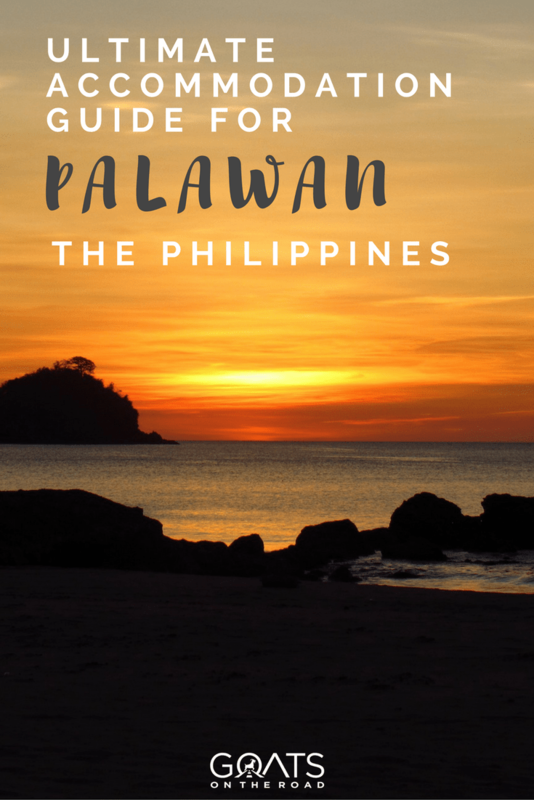 In this article I’m going to list the best Palawan resorts, sorted by town and price. 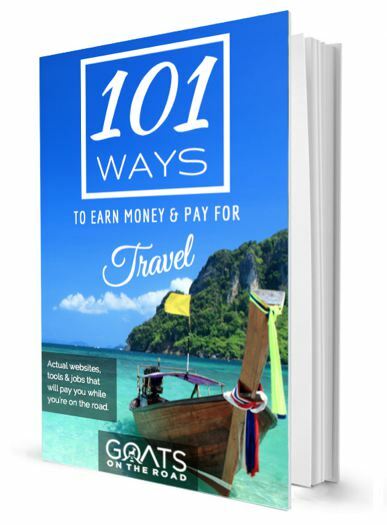 There are so many to choose from and this article is going to list the best, most highly rated resorts. Palawan is one of the most gorgeous islands in all of the Philippines, and is the perfect spot for a relaxing holiday. Luckily for you, there are numerous resorts and hotels available for travellers to stay in. From the pristine Coron Islands and the funky beach town of El Nido in the north, to the capital city of Puerto Princesa and the naturally beautiful Sabang in the center, there’s something for everyone on Palawan island! And with some of the best Philippines beaches, you’ll want to stay a while. Whether you’re staying in just one town during your trip, or visiting a few, there’s a resort for you. 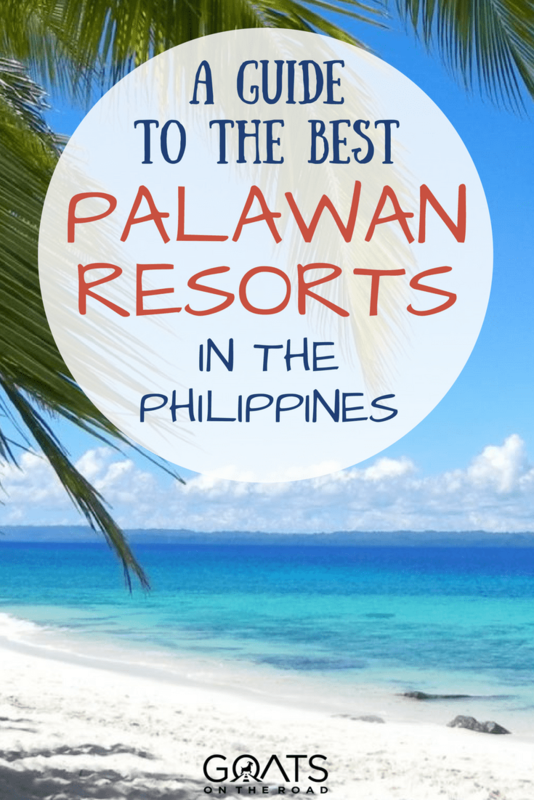 Here’s my list of the best Palawan resorts. 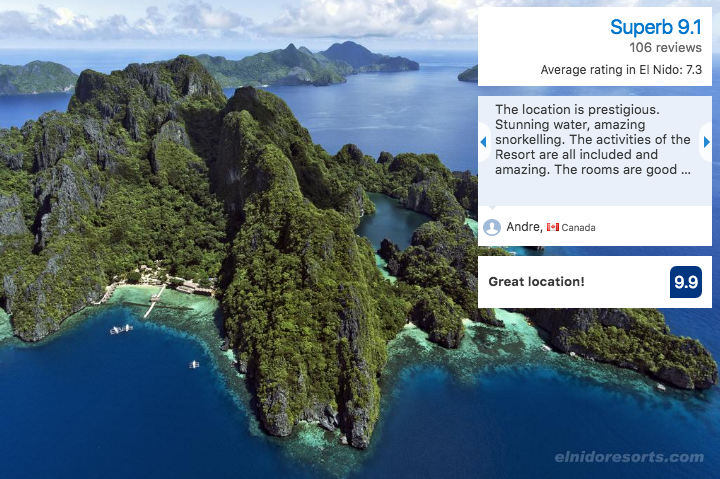 I’ll start with El Nido because it’s the most popular holiday destination on Palawan. Located at the northern end of the island, this is somewhere you could definitely spend a while. You’ll never be bored in El Nido. Surrounding the actual town itself are stunning limestone karsts jutting out of the ground, while offshore you’ll find numerous little islands waiting to be explored. It’s really all about the islands in El Nido! Garden Bay Beach Resort. From $35 / night. 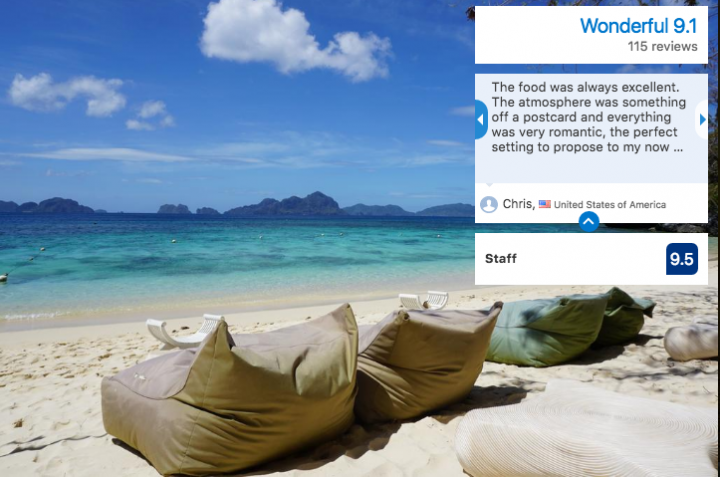 If you’re looking for an awesome budget option right on the beach, then this spot is for you. 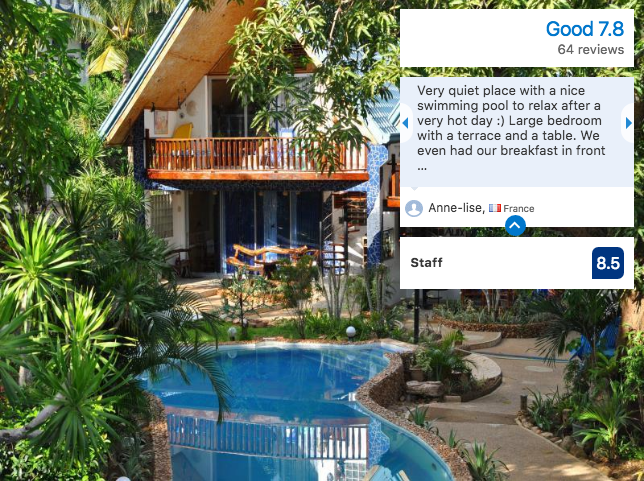 The accommodation includes breakfast, wi-fi, bike rentals, private beach and on-site restaurant. The Nest El Nido Beach Resort. From $108 / night. The rooms here are just 1 minute walk to the beach, and are beautifully decorated. 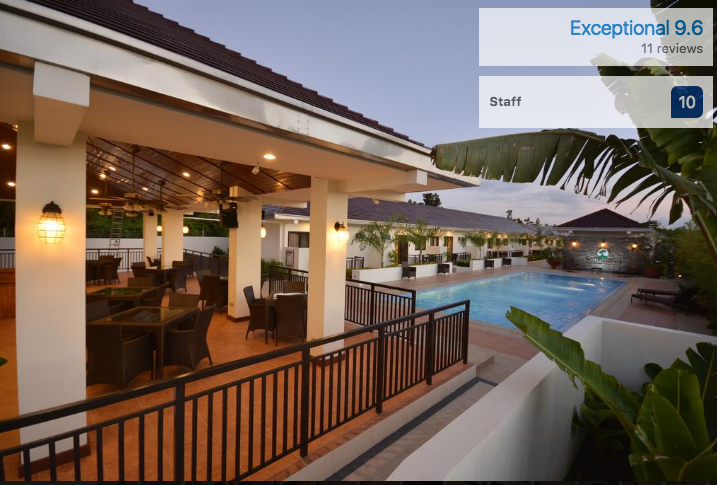 This place includes breakfast, air conditioning, flat screen TV, free shuttle service and it’s one of the highest rated Palawan hotels. Lio Villas Resort. 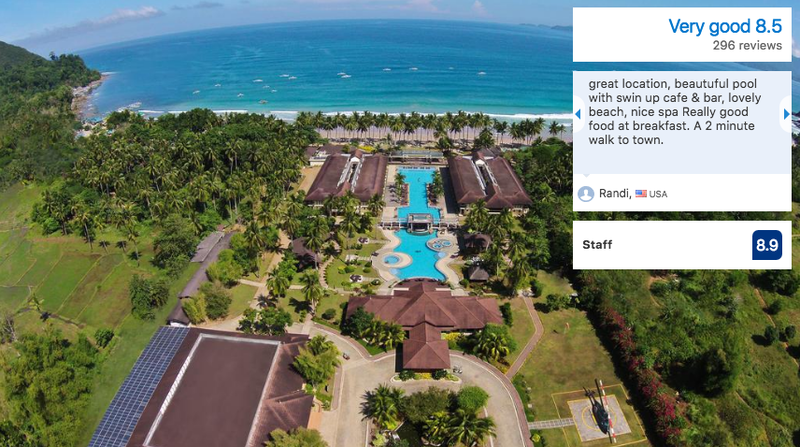 This place has long been one of the best resorts in the Philippines. From $98 / night. This peaceful property includes breakfast, air-conditioned rooms, wi-fi and an outdoor pool. Bicycle rental, massage and laundry are available. El Nido Coco Resort. From $195 / night. This place includes breakfast, air-conditioned rooms, an outdoor pool, sun terrace, on site restaurant and free parking. The property is just a 1 minute walk to the beach. Check out the tropical view! Buko Beach Resort. From $177 / night. Including breakfast, air-conditioned rooms, an outdoor pool, terrace with views of the water, an on-site bar and free parking. Vellago Resort (7 Commandos Beach). From $450 / night. Including wi-fi, air-conditioning, a stunning sea view and an on-site bar. Water activities and tours are available. Imagine lounging on those beanbag chairs right on the white sand. Perfection! Below are some islands which are offshore from El Nido. These are some of the most beautiful Palawan resorts! El Nido Resorts Miniloc Island. From $450 / night (two people), including breakfast, lunch and dinner. 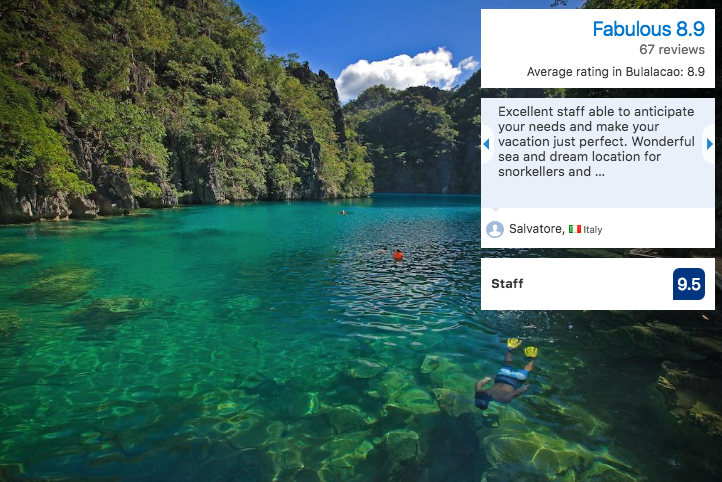 The locals might tell you “this is palawan best resort”. The resort also includes a free 40 minute boat transfer from the airport. Numerous watersports are available and many are included at the resort (snorkelling, windsurfing, sailing and kayak rental). This beautiful secluded spot is a must-see! El Nido Resorts Lagen Island. From $368 / night. 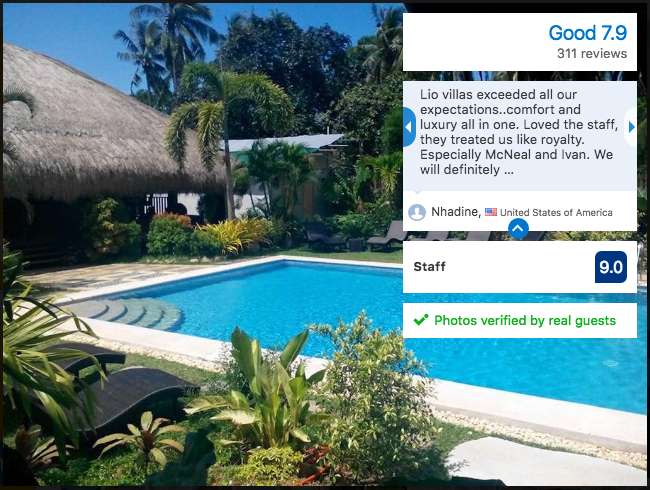 Including breakfast, air-conditioning, outdoor pool, spa and a free 50 minute boat transfer from El Nido Airport. The island itself offers hiking trails, bird watching, and secluded coves. What a spot! El Nido Resorts Pangulasian Island. 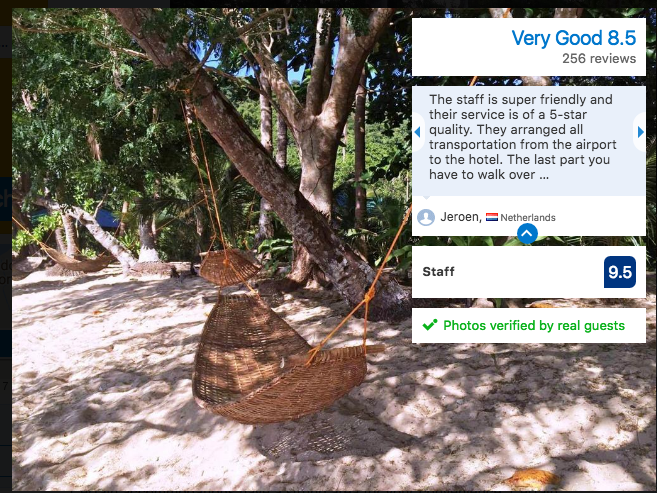 From $600 / night this is one of the best resorts in Palawan, hands down. Including a spa center, gym, wifi, breakfast, outdoor pool, restaurant and on-site bar. This area has some excellent snorkelling and scuba diving. Plus, the resort is close to the popular Big and Small Lagoon! Coron is actually a few things: it’s a town on Basuanga Island, a group of islets, and an island in itself! Located off of the northern coast of Palawan Island, Coron is the most beautiful area of Palawan, and arguably one of the most stunning in all of the Philippines. 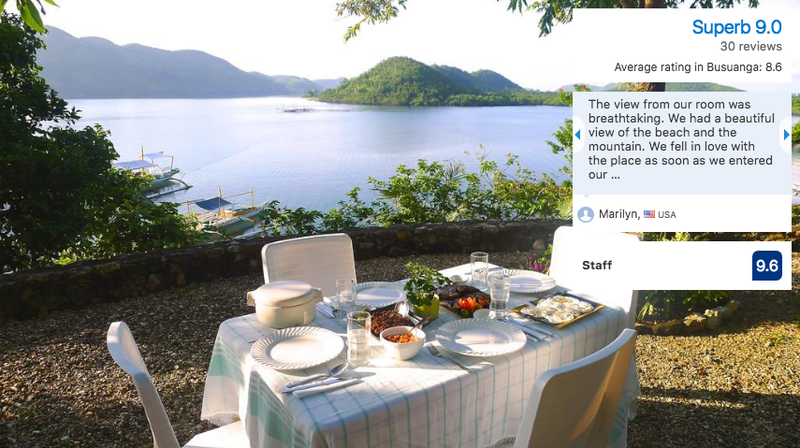 Most people head to Coron for the nature, snorkelling and the stunning landscapes. This is a place to truly get away from it all. 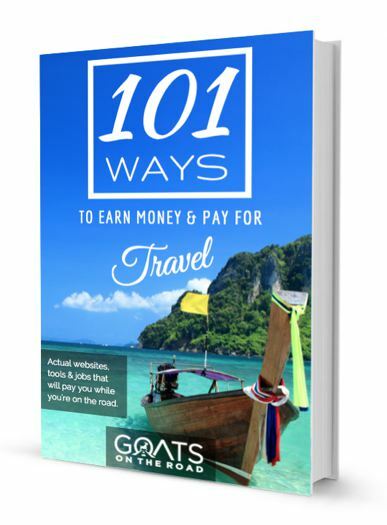 Spend you days hiking, lazing on the beach, snorkelling in crystal clear water, swimming in the cleanest lake in Asia, or soaking your muscles in the hot springs. 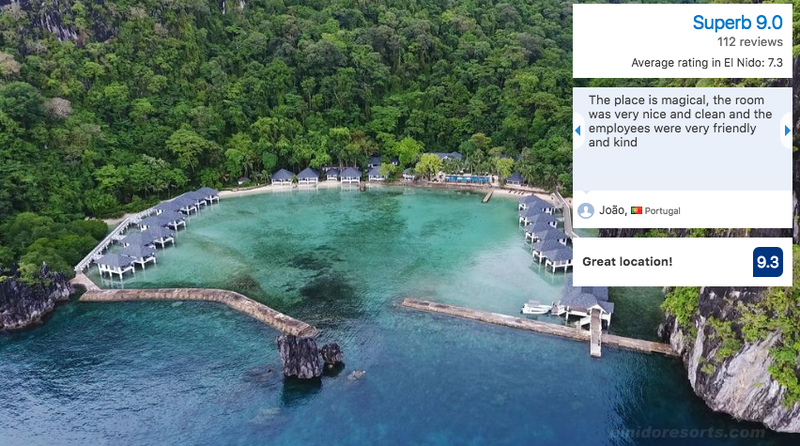 Here are the best Palawan resorts for Coron, sorted by price. Kokosnuss Garden Resort. From $39 / night. 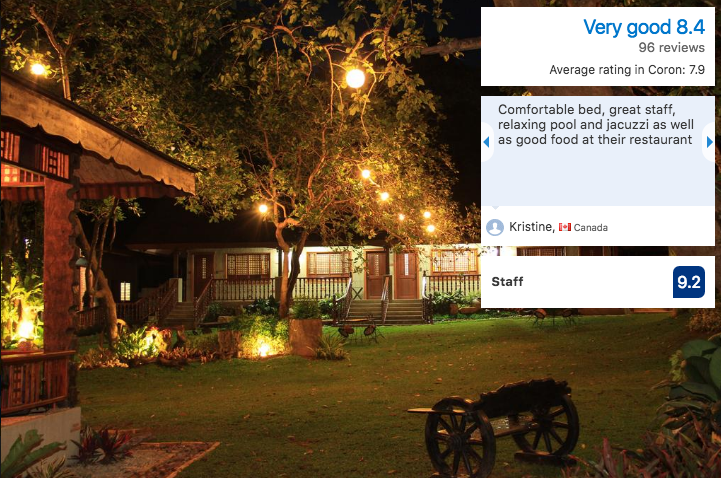 Including fan or air-conditioned rooms, wi-fi, on-site BBQ and restaurant. Massage, snorkelling, island hopping and laundry are available. This property is located 5 minutes from the town of Barangay. It’s just a 10-minute walk to the trailhead leading to Mount Tapyas Point, which is one of the most popular and beautiful hikes. The Maquinit Hot Springs are 25 minutes away by tricycle. Princess of Coron Austrian Resort. From $38 / night. 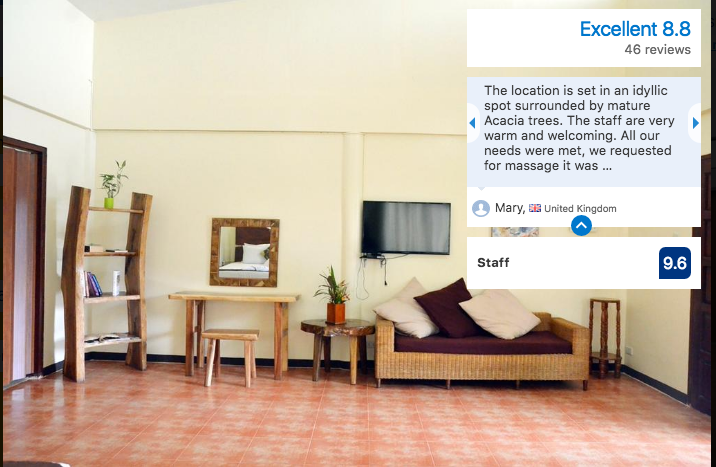 Including air-conditioned rooms, wi-fi, on-site restaurant and bar. This property is located in Coron town proper, and is 5.6 km from Kayangan Lake, 5.8 kilometers from Twin Lagoon, and Maquinit Hot Spring is 2.7 kilometers away. El Rio y Mar Resort. From $94 / night. 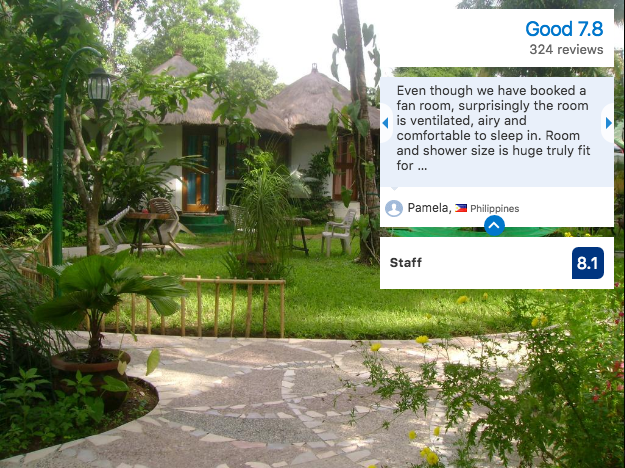 All bungalows here are beachfront and include breakfast, air-conditioning and wi-fi. There’s an infinity pool, in-house doctor, on-site restaurant & bar, spa and dive center. El Rio y Mar Resort is an hour drive from the airport and is in a highly rated location. ☞ Click here to see the latest price on Booking.com. Sophia’s Garden Resort. From $88 / night. Including breakfast, wi-fi, air-conditioned rooms, an outdoor pool and an on-site restaurant. This property is located in Coron Town proper and is just a 5 minute drive to the market. Sangat Island Dive Resort. From $240 / night (for 2 people), $180 / night for 1 person. Located on Sangat Island. This property is an all-inclusive accommodation. All meals and some drinks are included in this price, as are some water activities as well. There’s a sun terrace with seaviews and free shuttle service. Sangat Island Dive Resort is located just 16.1 km from Twin Lagoon, 16.1 kms from Kayangan Lake and Maquinit Hot Spring is 17.7 km away. As the name suggests, this is definitely the spot to come to if you’re looking for a scuba diving holiday. However, it’s also a great place for relaxation and snorkelling. Busuanga Bay Lodge. From $172 / night. Located on Busuanga Island. Including breakfast, wi-fi, spa, fitness center, infinity pool, wine cellar and on-site restaurant. The rooms have ocean view and are air-conditioned. There are endless activities to do here – fishing, scuba diving and non-motorized watersports (free). Two Seasons Coron Island Resort & Spa. From $530 / night. Located on Bulalacao Island. This 5 star property includes breakfast, air-conditioning, round-trip airport transfer and free use of non-motorized water sports equipment. 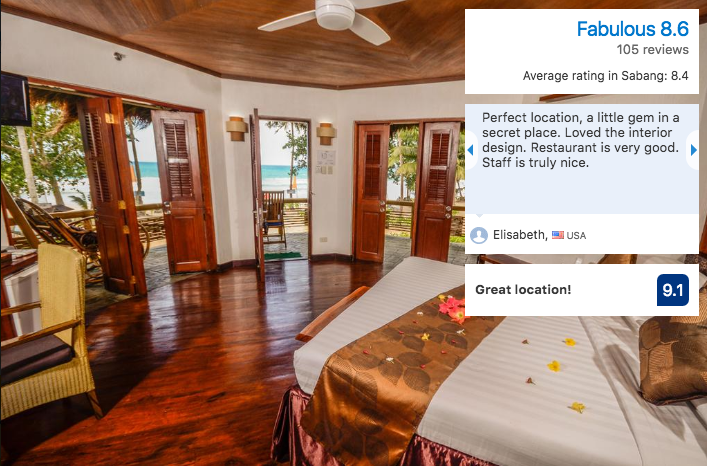 The stunning property boasts a private beach, dive center, spa, on-site restaurant, and luxurious bungalows. La Estancia Busuanga. Located on Busuanga Island. From $108 / night. The property offers air-conditioned rooms, an outdoor pool, barbecue area, sun terrace, on-site restaurant, parking and free bicycle rentals. Plus, check out the private dining spot in the photo below! Amazing. This is the capital city of the island of Palawan, and unless you fly directly to El Nido, you’ll land at the Puerto Princesa airport. There are a few things in the actual city to keep you busy, but most people use Puerto Princesa as a base for visiting nearby Sabang, Honda Bay and the Underground River. 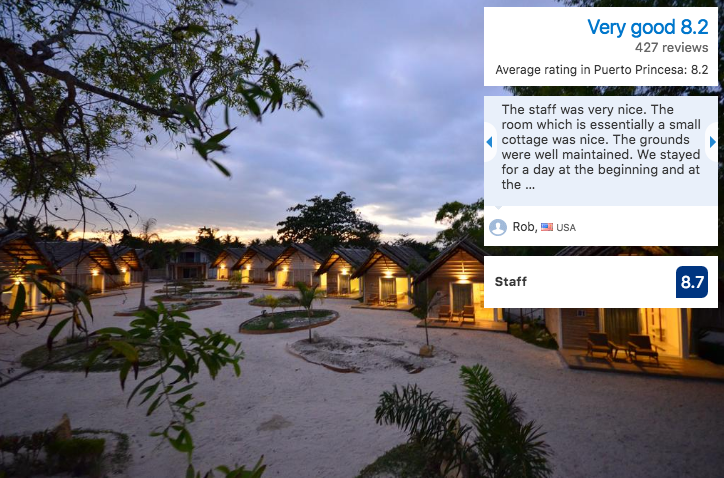 Here are the best Palawan resorts for Puerto Princesa, sorted by price. Southwind Palawan. From $35 / night. This new hotel / resort includes wi-fi, breakfast, a restaurant, an outdoor pool, shuttle service and parking. This place offers great value for money. Panja Palawan Resort. From $55 / night. Including breakfast, outdoor pool, sun terrace, on-site restaurant, rooftop bar, wi-fi, air-conditioning, free parking and free shuttle. Check out that expansive view in the photo below! Ponce de Leon Garden Resort. From $75 / night. Including breakfast, an outdoor pool, barbecue, playground, on-site bar, ping-pong table, air-conditioning, wi-fi and bike rental. 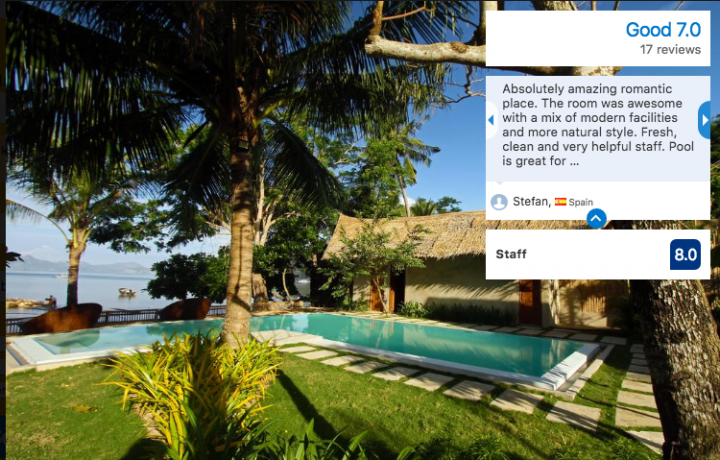 This resort is located just 4 kilometers to Honda Bay. Blue Palawan Beach Club. From $59 / night. 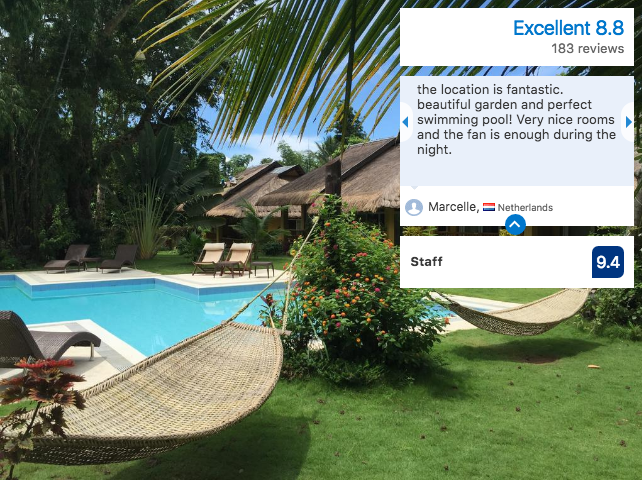 Including wi-fi, air-conditioning, breakfast, private beach area, outdoor pool, free parking, free airport transfer, on-site restaurant and drinking water. Plus, guests can use the kayaks, SUP boards, and small sailboats for free! Honda Bay is 3.3 kilometers from this property. The value for money here is great! Princesa Garden Island Resort & Spa. From $109 / night. Including breakfast, wi-fi, air-conditioning, outdoor pool, fitness center, free airport transfer, welcome drink and an on-site restaurant. Honda Bay is just 7 kilometers away from this property. The setting of this property amongst the palm trees is incredible! Ai World Park and Resorts. From $138 / night. 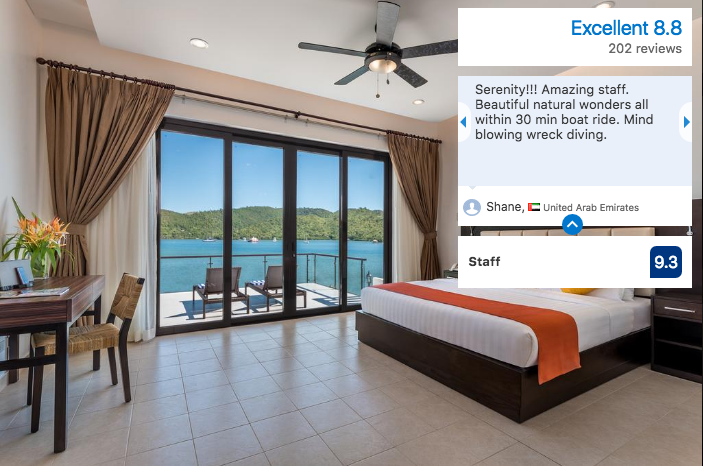 This property is located 11 kilometers from Honda Bay and includes breakfast, air-conditioning, wi-fi, an on-site restaurant and bar and free parking. This property is a new listing on Booking.com and therefore doesn’t have any reviews just yet. Maybe you’ll be the first? 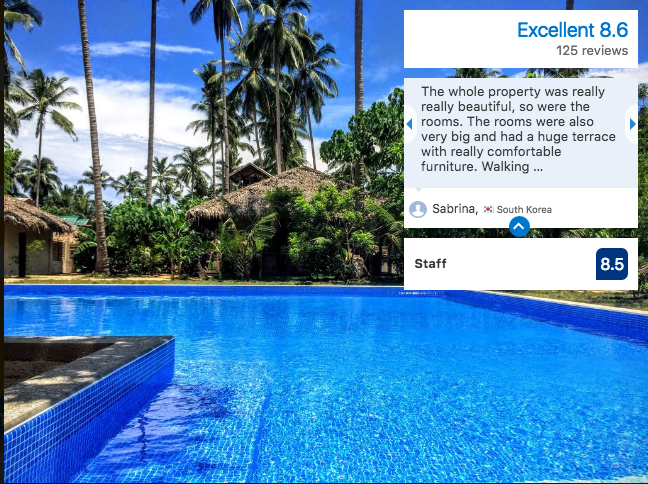 Sabang is a great place to base yourself if you’re looking for total relaxation. The beach here is beautiful and is a great spot for snorkelling, or just chilling out on a lounge chair. The famous Underground River is closeby, making Sabang a great place to book your Palawan resort. Daluyon Beach and Mountain Resort. From $78 / night. This property has excellent views of the West Philippine Sea, and is located right on Sabang Beach! Rooms here are air-conditioned with balconies and TVs. There’s an onsite restaurant and bar, an outdoor pool and breakfast is included in the room rate. The Puerto Princesa Subterranean River National Park, is 5.2 km away and the Puerto Princesa Airport is 53 km away. The setting of this place is unbelievable, and the price is excellent. 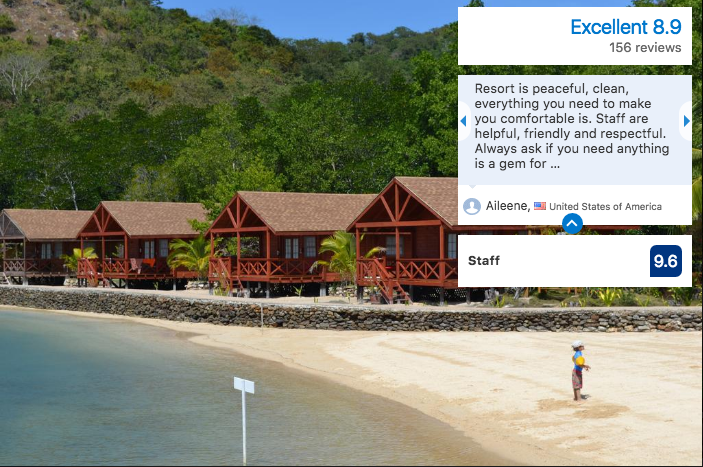 Sheridan Beach Resort & Spa: Rooms from $117 / night. This is the most popular resort in the area, and for good reason! The pool here is the largest in Palawan and offers a swim-up bar. Rooms include breakfast and have private balconies with either pool, mountain or garden views. 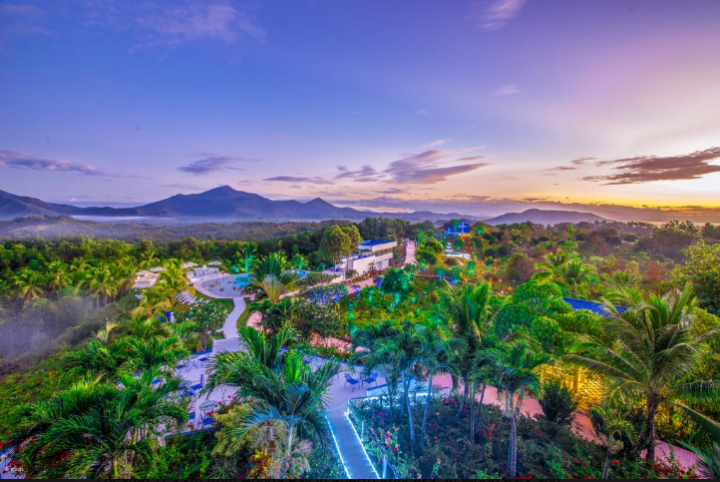 There’s an onsite gym, spa and restaurant serving organic food. If you’re feeling adventurous, you can book a mangrove tour or ATV’ing in the jungle. 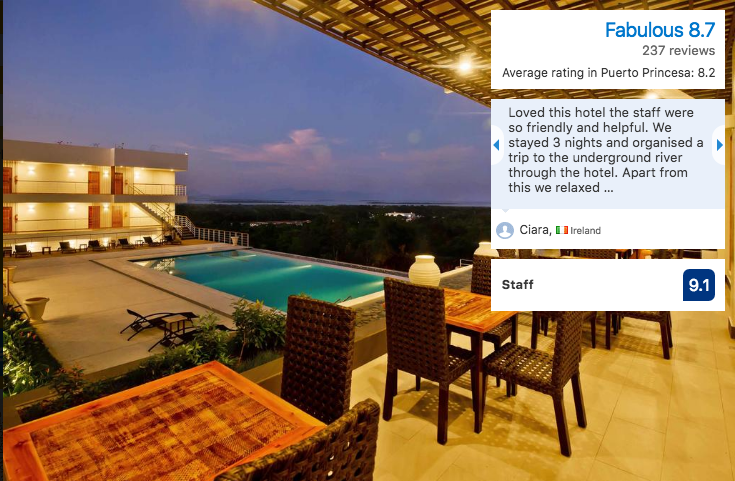 The property is only a 20 minute boat ride to the Underground River and a 2 hour drive from the Puerto Princesa airport. Don’t miss this beautiful place! 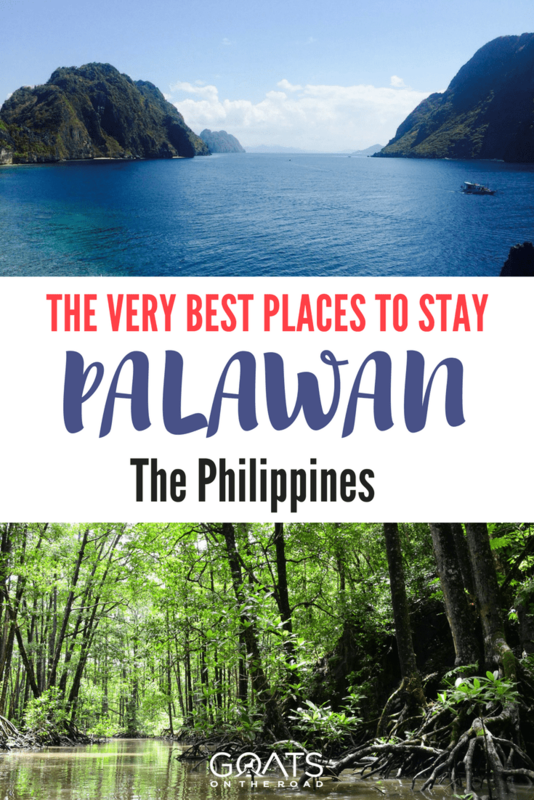 Hopefully this list helped you decide which resort you want to book for your holiday on the beautiful island of Palawan. This truly is a pristine place and is the ultimate destination for relaxation and adventure. 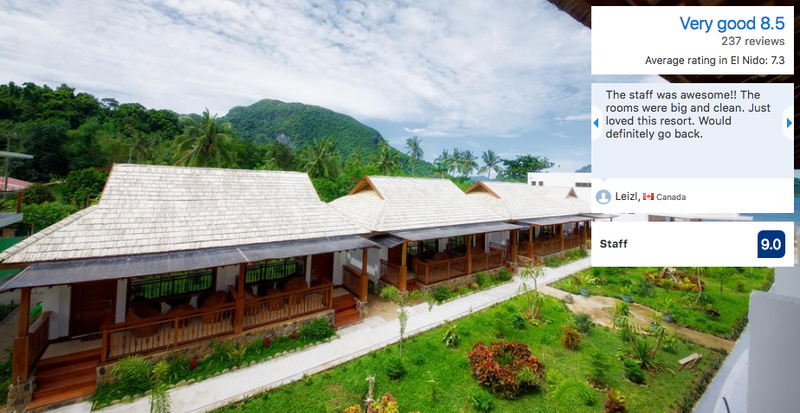 Pick one of the best Palawan resorts and enjoy your trip! Palawan is stunning. Loved the snorkeling and diving experience there. Philippines has some of the most scenic islands and beaches in the world. I was thinking to visit palawan. Your information will help me a lot. Hello Dariece, Thank you for this beautiful article about Philippines.